The yard is a busy, busy place right now. Every window and door leads out to a view of some crazed activity. The butterfly bushes in the front and side are simply alive with creatures. I sat in the window and watched the largest one for a while yesterday. There are Monarchs, Yellow Swallowtails, and the large black butterflies with the blue spots, along with scads of white and yellow sulphurs. There are many other butterflies - browns, and ambers, and the tiniest azure. Among the branches are gold finches, house finches, and purple finches, all taking turns lighting on the nearby echinacea. At one point a hummingbird came along and sipped from the blossoms of the butterfly bush, and then a sphinx moth showed up today - the first I ever saw in broad daylight. Out back there is constant motion. There is a slight breeze, and the butterflies vie for space on the parsley and dill, while the birds push each other off the blueberry bushes and peck at the sunflowers. Flocks fly from tree to tree with no real plan that I can discern. They seem to have taken care of the earlier beetle infestation, and now I really wish they'd do something about the flies. Farm country, and it is fly season. Yuck. The caterpillars are going to town on the dill. There are about 10 of different size that I could count, and they are really very difficult to see without looking intently for a few moments. Their pattern is very similar to the dark and light of the flowers/stems/air. We also have an abundance of bees. I don't know enough about bees to know if they are honeybees, but they are out there - all shapes and sizes, sipping away on the nectar of the flowers all around. Sort of reminds me of "The Ugly Bug Ball" that Burle Ives sang in Pollyanna to little Hayley Mills. Here in human-ville, my daughter got her driver's permit today and we had a little lesson. I learned a lot. I learned, in particular, that I may not be cut out for this whole driver's ed thing. I learned that making jerking motions and stamping my foot while seated in the passenger's seat has absolutely ZERO effect on the motion of the vehicle. I learned why some people drink in the middle of the day, and most of all, I learned that if my daughter is proud enough of herself, she'll believe me when I say, "you did a great job, hon!" even when I am visibly shaking. In other news, a parcel filled with Chukar chicks arrived at my sister's house for BIL to raise. We'll have another flock around for the year, and another gang to take up the bizarre mating call next spring. Maybe the lonely little guy that spent most of May on my roof listening to the echo of his calls coming from the building across the road might actually find a lady next spring. We decided to have a little fun on Saturday mornings, and signed up to take a stand at the local farm market. It is a small-ish market with about a dozen vendors, and it is a very friendly group! Almost everyone sells produce, although there is local honey, fresh baked goods, plants, jars of preserves and pickles, and home made dog treats. My sister's soaps and my books and magazines were a welcome addition. 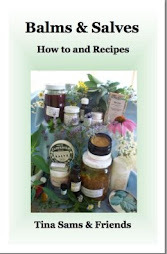 We also took along some herbal products that we make jointly. I've always enjoyed retail. It's a little more difficult to enjoy it when the products are of your own hands because there is the whole aspect of ego, putting a value on your product, and having to stand behind what you make, but after the initial shock, it is more satisfying to sell our own things than those just bought for resale. Of course retail has it's down side. After selling our shop years ago, it became clear that being tied to the unending hours of owning a shop is only for the most committed. It was a dream job, but there were always those small irritants of difficult customers, delayed shipments, overhead, and time, time, time. We found the farm market to be perfect! 4 short hours of face-to-face interaction. The best part is that we can take what we have and not sweat what we don't. No pressure. We pulled stock on Friday, threw a table and stools in the car, and off we went the next morning. It's a great way to test out new products, sell off discontinued fragrances, and make new contacts. The market itself is in a covered breezeway of a local bank that is closed on Saturdays and allows the market to use the space. Everyone is under roof, and there is a nice bit of air flowing. There is just the right lighting, and since it's a small town there is a feeling of talking to neighbors. We did get to renew some acquaintances both from our old shop customers, and some unexpected friends with whom we'd lost touch. We met a lot of new friends too. People are not in a hurry. On top of that, we got to buy some goodies to bring home. The woman next to us had some incredible cabbages, and across the way were whoopie pies and molasses cookies. Local honey came home with us too. Oh, and some big sandwich tomatoes! The men across the way were selling glads, zinnias, and sunflowers, and gave us each a bouquet when the morning was done. Yesterday was one of the most beautiful days of the year thus far. See how happy Maryanne looks? It was sunny and cool with almost no humidity. I'm hoping the market will continue to be as simple and enjoyable as our first day out. Next time, we'll add a second table so that everything isn't so squished together, and so there will be room for the rest of TEH books. 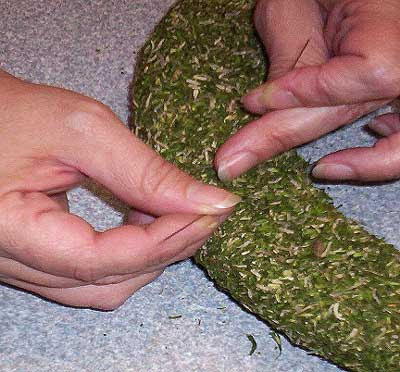 There is a recipe exchange, and I'll harvest bunches of fresh herbs to go along with the recipes that we will submit. I woke up this morning to some perfect weather. There was a lovely breeze coming in the office window, almost no humidity, and mild mid-70's predicted for the day. We've been baking in a sauna lately, so this was entirely, whole-heartedly welcome. There were a million things to do. I hurried to get orders packed up and shipped so that would be done for the day, and grabbed some groceries on the way home from the post office. The yellow Queen Anne cherries must have had a great year, because they were the same price as the Bings. Yummah! After lunch, I had an appointment with the soap wrapping machine, and to put finishing touches on the upcoming issue of the magazine, but first it was into the woods. I went alone and have mixed feelings about that. On one hand, it's such an incredible feeling of solitude, and being *in* the woods, while on the other, there's that feeling of solitude and being *in* the woods. It started out walking along the pond. I stopped to see if I could catch a glimpse of the koi under the duckweed. Directly behind me in the underbrush of the bank something moved. A lot. It could have been a groundhog, or a rabbit. Or it could have been a snake. And so it begins. Why, oh why do I never bother to change into boots? This spring, my brother-in-law cut a path along the creek that runs through the woods. I thought it would be a good chance to see what grows there because up until now it has always been too overgrown to actually get in there any time beyond the end of May. There is an entire meadow of jewelweed! It is beautiful all along the path. However, there hasn't been a lot of rain lately. That means that there are little pools of stagnant water where the creek isn't running fast enough to keep it moving. Bugs. Lots and lots of bugs. But the butterflies made up for that! They were everywhere, and I probably saw 10 or 12 different kinds. I'd taken along a berry basket just in case there were some stragglers to pick. I was very glad to have something to swing because the spiders have found the path to be an excellent place to weave webs and catch stuff. Today that was me. It's hard to keep your eyes on the path to watch for snakes while swinging a basket ahead to avoid spider webs. It must have been an amusing sight to the deer who were watching from behind the brush. Towards the end of the woods, there is a steep hill that leads to a field of evergreens. I walked along the edge of the field, and discovered that Japanese beetles must really love wild grape leaves. All along the ground were leaf skeletons in varying shades from pale green to dark brown. They look like lace, and I scooped up a few of them. There must be a way to preserve them, because they are just beautiful. As I got to the grove of Mimosa trees, the scent of the blossoms hit me full force, stopping me in my tracks. How have I never smelled that before? We had purchased some Mimosa wax when we had the shop - a byproduct of the process used to acquire the absolute used in aromatherapy. It was not nearly as fragrant as the flowers! The afternoon ended with me watering the garden, and my daughter blithely leaving the house and LOCKING THE DOOR so that I couldn't get in! Luckily, she was just down the hill. The little scamp. Yeah, that's what she is. Oh... and I think I found some Jersey tea. I'll have to look more closely tomorrow. That will have to wait until we get home from our first day at the local farmer's market. I can't wait to see how that goes! The time is right to make a wreath, should you be so inclined. The simplicity and beauty of this craft is so rewarding, yet many are put off by the seeming complexity of it. Wreath-making classes were always quite crowded (and messy), and the creations almost always surprised the participants with their talent. 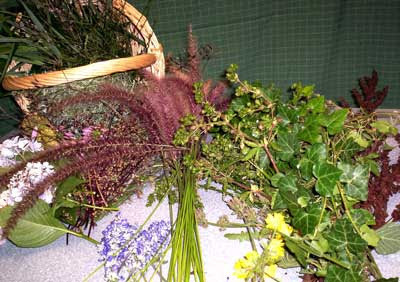 We began this particular session by going into the garden and nearby meadow in search of interesting looking botanicals. Grasses and seed heads are gorgeous, and we’ve seen really gorgeous wreaths made with nothing but the russet dock seed heads and pennywort that grow as weeds around here. Some of the other things we chose were hydrangea, ivy, bee balm, bamboo leaves (they were surprisingly pretty on the wreath! 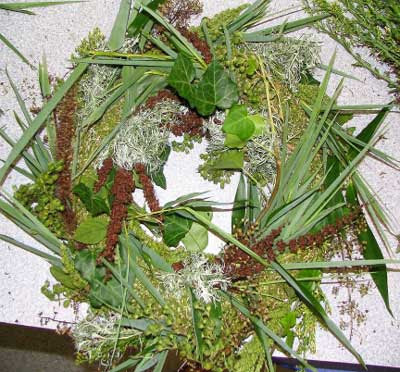 ), ornamental oregano, sage, yarrow, silver king artemesia… and whatever other plants struck our fancy. Filling a basket was easy. Stopping was a little bit harder, as the more you look, the more you see. Try to imagine how much the things will shrink when dried. There are a few other things you need. 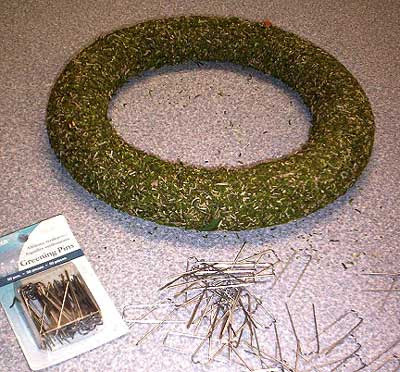 A wreath form, greening pins, and a piece of wire for a hanger. These items are available at craft stores. We used about 75 greening pins for this wreath. The first thing you need to do is form a loop that will be the hanger. You may first wish to wrap the wire with florist’s tape – green lightly tacky tape that you see on floral arrangements. We did not in this case, but it adds a nice finished touch. 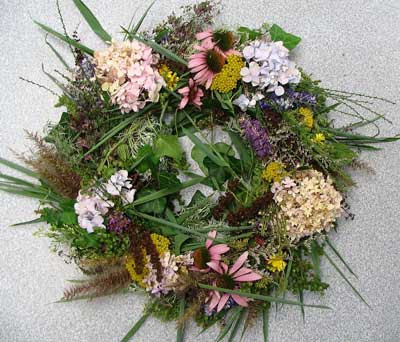 Another consideration is to tie a ribbon to the loop so that its easy to find when the wreath is full and lush. Wrap the wire around the form and twist it closed. With the two ends, make a small loop and twist the ends together with the wire where the original twist took place. sold hundreds of prince’s pine wreaths each holiday season. We made them for her, and if there were any holes, less than perfect branches, uneven spots, or lopsided-ness….we heard about it! Although our fingers were bruised and bloody that year, it was a great lesson in how to make wreaths, and how much more fun it is to do them for yourself. Begin by choosing a background for your wreath. The form that we used here already had a green herby base, so we started with bamboo leaves – mostly because the bamboo plants are taking over the one hillside, and it seemed appropriate. Choose sections about 4” – 6” long and pin them to the form, overlapping them about 2” apart. Go the same direction all the way around. The outside ring will go in the same direction, and is the next step. Alternate with other materials where you like. The small 4-6” sections that are pinned on can resemble small nosegays or bouquets. 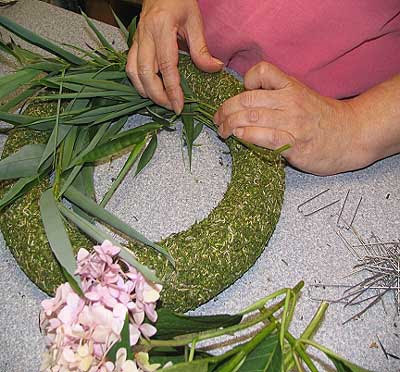 The third shot of the wreath in process, shows the inside and outside rings completed as we are just about to start adding the center circle. At this point, we make certain that the form is closely covered, adding bits here and there, making the inside and outside rings full. We saved most of the flowers for the top or center ring. Now the real fu n begins. The center circle is set in the opposite direction to the inner and outer rings. 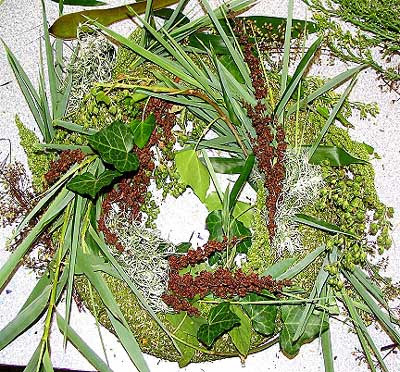 This is done to make certain that the wreath is full and that there are no holes showing. This feels a lot like frosting a cake. The tiny bouquets are added to all the spaces you can cram them into, resulting in the finished photo at the beginning of this post. Dry the wreath flat on a table or counter. 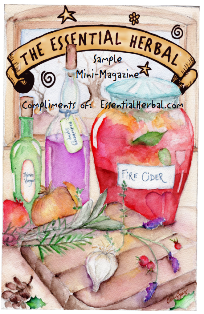 After two days the botanicals will have dried and shrunken, and you may then choose to add more so that it is full. 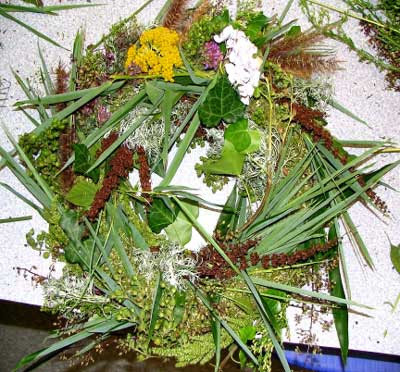 Wreaths can be made with almost anything you find growing – and even other found articles. Have fun with it, and if you don’t like it one way, take out the pins and start again! 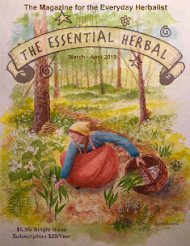 If you've read the Jul/Aug issue of The Essential Herbal, you've seen the little sidebar Maryanne Schwartz wrote about the PA Dutch symbol, the distelfink. Distelfinks are "thistle finches" or gold finches and there are many around. There is one perched on the tip of a pine tree right outside the window as I type. In the symbolism of the old hex signs placed on Amish barns in our area, they represent harmony and happiness. Combined with cardinals and bluejays, they round out the color wheel here, bright flashes of color. However, the article also mentioned that the PA Dutch were quite superstitious, and some of that has filtered into my life. Only once have I acted on it, and I prefer to chalk that up to the insanity of menopause. But I digress.... The point is that we play a little game here. For me, it began when I was on my way home from my final day of work before beginning the frighteningly expensive gamble that would eventually bring my daughter into the world. I was afraid and full of doubts, wondering if I was making a very bad choice. As I rounded a bend on a back road, there stood about 30 wild turkeys. I'd never seen wild turkeys before, and the sight was so magnificent that I stopped the car and sat and watched them. I can't explain it other than to say that they calmed me, and I knew it was going to be ok. I know, I know. It sounds weird. Since then, I've enjoyed watching and considering the birds and animals that cross my path. When we were vendors at the renaissance fair, we started counting the ringneck pheasants we saw on the way each morning, and decided that they were omens of good money days - as in, "it's a three pheasant day!" It was just for fun, and on one of our best days ever, we rode along the way home, only to come across a large group of cows that had just discovered their freedom. They were fairly flying across the roadway, scurrying up into the field of grain. We called them the "happy, dancing cows" because that's how they looked. 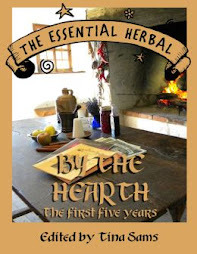 We enjoyed relating the story to the other vendors, who by then had started to ask us what we'd seen.... yeah, the ren faire is like that :-). As for turkeys, they've returned on a few occasions. Once when I was driving to meet my sister to look at the shop we were thinking of renting, and again, I took that as a green flag. Later, before signing the lease, we went to the beach with the kids for a few days to ponder that move, and a school of dolphins came up to within a few feet of us. They played at our feet, and my sister and I just looked at each other in astonishment. But the point of this post (yes, there is a point) is sunflowers. One evening, many years ago, my sister and I sat in an apartment in NYC with our friend Laura, talking about our dreams and sunflowers. We considered how the massive stalks spring from the earth and produce the gorgeous blooms. The blossoms look towards the sky, growing beyond the bounds of "normal" and proceed to grow massive plates of seeds that are then scattered, growing more impossible dreams. Silly as we are, we dubbed ourselves "the sunflower women" and went for our dreams. To this day, I'll occasionally go to the mailbox and find a card from Laura with a glorious picture of a sunflower (or 3), and be reminded to keep going. This year, a volunteer sunflower found it's way to my garden. This is no ordinary sunflower. Short in stature, it is a powerhouse of blooms. I've been watching it in amazement each day, and this morning realized that this flower is for Laura, as she embarks on an exciting new aspect of her career. So Laura, CHECK IT OUT!!!! This one's for you. Go, LittleBigVoice, and don't look back! I'm not even going to show you the veggie garden right now. The peppers, squash, and cucumbers are fairly frightening in their proliferation. The tomatoes are turning red, and the canteloupe and watermelon vines are so covered in small fruits that there just has to be a fruit stand in my future. There's no way I'll be able to eat, share, or unload all of those melons on my own. It was only 3 of each plant, but they took off like crazy. The beans are also pretty darned happy, with the eggplant looking heavy too. I love summer eating. This year after we stained the decks a light color, I wanted something bright on the front, and got a big hybiscus. It was a great choice, because once it started blooming, it makes me happy every time I see it. There are pink and white marshmallows on the other side of the entrance to the deck, so in another couple of days it is going to be breathtaking. The beetles don't seem overly fond of either plant right now, preferring to dine on the Virginia Creeper that found it's way into the front garden. Hope it stays that way for a while, because they are bad this year. On the side of the house, beyond the yard, there are several rows of powder blue Spruces. I'm not sure if they are the Schwartzii blue spruce, propagated by my brother-in-law's father, but I think they might be. They are the bluest blue. They look so pretty against the bumper crop of queen anne's lace that grow among them. One year my sister and her husband did wreaths out of them for a national catalog. We put burgundy velvet bows on them, and they were spectacular. Those needles are very prickly, though. Some people do take them inside to decorate over the holidays, but they're too mean for me. I like them outside just fine. This year, after the septic system was cleaned, there was an oval garden added - just a few inches of dirt, surrounded by stones. That's where the rescued chamomile from the construction site lives. These sunflowers volunteered right at the end. They aren't very tall, maybe 3 feet, but there are lots and lots of flowers. Somehow we got a gourd vine in there too. Can't wait to see how that turns out, and what sort of gourds we get. The last picture was taken last week when we went out on a delivery run. We started to notice that there were small fields of tobacco popping up everywhere. When I was growing up, tobacco was a big crop around here. The type of tobacco typically grown locally is the stuff that is the outer wrapping of cigars (of course we rotten kids didn't know that when we snitched leaves to dry and roll up in our notebook paper and try smoking - dumb kids!). Most farm boys raised a patch every year. Tobacco is very labor intensive, requiring topping at a specific time, and then being speared on lathe and dried in a special aerated part of the barn. Tobacco brought very good prices, and those boys used their tobacco money to buy hot cars. As time passed, there was less and less tobacco grown here. The prices dropped, and we switched to corn, soybeans, wheat, and a variety of other crops. So it was odd to see so much tobacco out there. One of my brothers remarked on the same thing when I saw him last week. Could it be that the demand for corn (biodiesel fuel) has switched other parts of the country to a different crop, making tobacco prices worth growing it again? Anyhow, I guess that will remain to be seen. On that same trip, we also saw - for the first time in about 25 years - a field of wheat that was in shocks. Wow, I couldn't get my camera out in time, but I sure was surprised and thrilled to see that again. What's next? Snow fences? New Stuff - and a SALE! 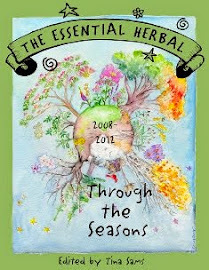 We have had a bang-up year so far at The Essential Herbal! Our subscriber rate is growing by leaps and bounds, and we feel very gratified. On top of that, the plants around us have been doing very well, supplying us with inspiration and lots of good food. In honor of our good fortune, we'll be having a sale all during the week of the fourth. It starts tomorrow (Monday, July 2) and will run through July 8th. Just add the word BANG! to the comments section of the shopping cart, and we'll deduct 10%. Order over $44, and shipping is free. This sale does not include wholesale, subscriptions, or advertising . It does include everything else - books, t-shirts, and some new stuff that we'll introduce right now. These items can be found under "Essential Favorites" . We also put together an "Outdoor Trio". This includes the Hiker's Releaf, a lovely bar of jewelweed soap (cold-process, all vegetable), and a Bug-Wand. 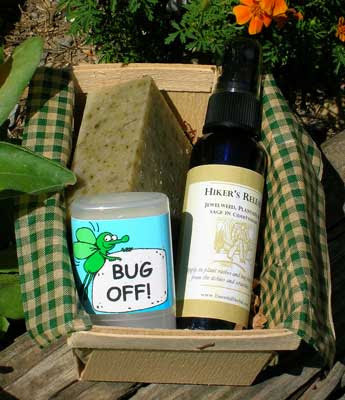 The Bug Wand is a solid lotion bar in a convenient push up container. It is full of essential oils said to be helpful in repelling the bugs that love us so when we are out doing what we love - be it gardening, hiking, fishing, or any other outdoor activity. Sold separately, the items are $17.55. The kit is only $16. We've started to carry the CobraHead gardening tool, too! Last year I did a review on the CobraHead. I usually get frustrated with just about any garden tool, and eventually just get in there with my fingers and start ripping. Not good. So I was pleasantly surprised to find that this tool didn't let me down. It is built to get in under the roots and pull them up without having to break a sweat or break a nail. It is stronger than anything I've used before, and now I don't want to be in the garden without it. $24.95 includes shipping! 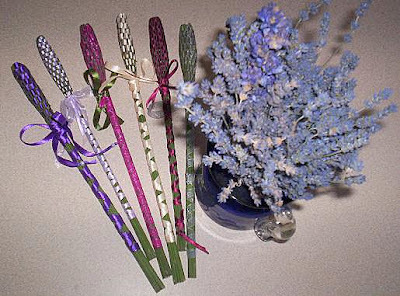 We wrote about weaving lavender wands a few posts back, giving full instructions and lots of pictures. Even so, we know there are people who don't have the plant available and want one of those wands! We put them up on the site too. They are $7.50 each. There are some other goodies too. Some are still on their way here - some old favorites from our shop days. Incense matches, some favorite incenses, herbal magic candles, and amber filled boxes! They'll be up in the next day or two. I hope you'll find something you like, and help us celebrate!! !